Hello Dagný! How would you describe your project? 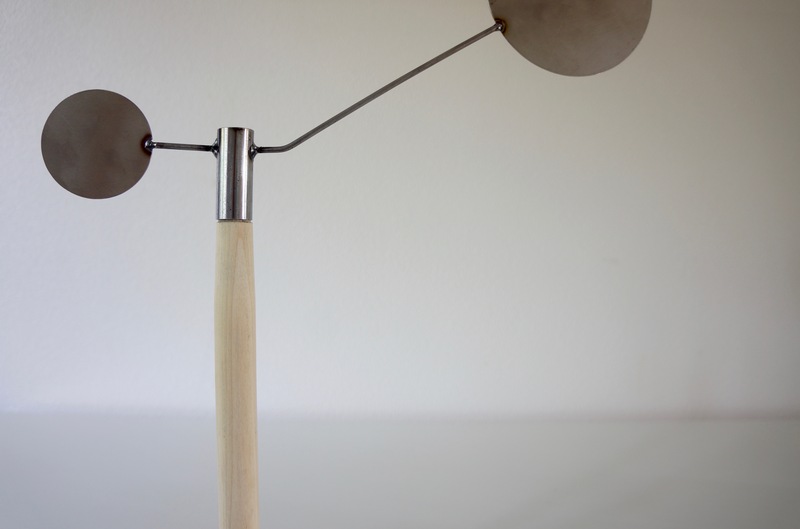 Blikur is a series of four objects made out of materials that change in dialogue with different atmospheric conditions to reveal patterns of the weather with movement rather than numbers. The objects are sensors measuring atmospheric pressure, temperature, humidity levels and wind direction. They encourage the viewer to learn how to read into nature—into its surroundings and seek to reestablish the connection between humans and nature. 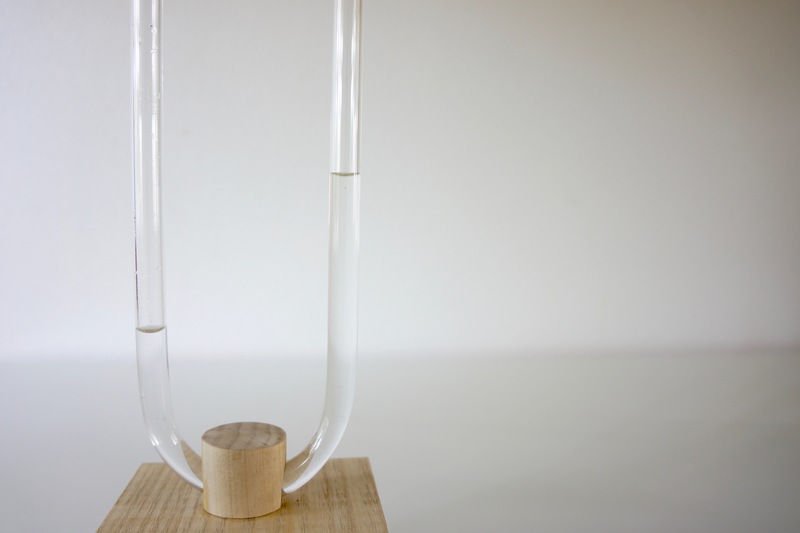 Barometer, I become atmospheric pressure. An instrument measuring atmospheric pressure, used especially when forecasting the weather and determining altitude. When the liquid on the open end is high, rain or storms are expected depending on how it reaches. When low, clear skies and dry weather is expected. Materials: Ash, glass, water. What were you thinking about at the start of the project? What were you responding to? Were there particular outcomes you were hoping for? In the beginning I didn’t have a set goal in mind or a problem to solve but I had a point of interest: memory and senses. Blikur is the fruit of my curiosity and interest in natural processes. It’s the manifestation of an idea, situation, patterns and a vaporous feeling, translating the intangible elements into a visual form. Anemometer, I become atmospheric direction. An instrument for revealing the direction of the wind. Materials: Ash, aluminium. Can you describe your research and making process? What were you reading? What went smoothly? What went unexpectedly? In the beginning I wanted to extend the research I did for my B.A. thesis into my project. I wrote about the connection between the sense of touch and how we experience our surroundings, and I sought to answer questions like what is the purpose of our body in the digital age we live in. I began to look into the sense of smell and its strong connection to our memory. I was intrigued by the idea of bottling up a memory like a perfume, never fading nor going stale, where one could uncork the bottle and relive the moment time and time again. Whilst collecting stories from the people around me, speaking to geologists, meteorologists and reading books on the atmosphere I soon realized that nature has its own way of encapsulating atmospheric memory. One is how the atmosphere can be reconstructed like a recipe from glacier bubbles, making us able to breathe in air from millions of years ago. But the time span of glaciers can be really hard to relate to for us because we only live for 90 something years if we’re lucky. So I began to look closer and became fascinated by sensors and tools that were used to measure variables in the atmosphere and that’s where the project started to come together. Thermometer, I become the warmth of the sun and the cold of the gale. An instrument measuring atmospheric temperature. 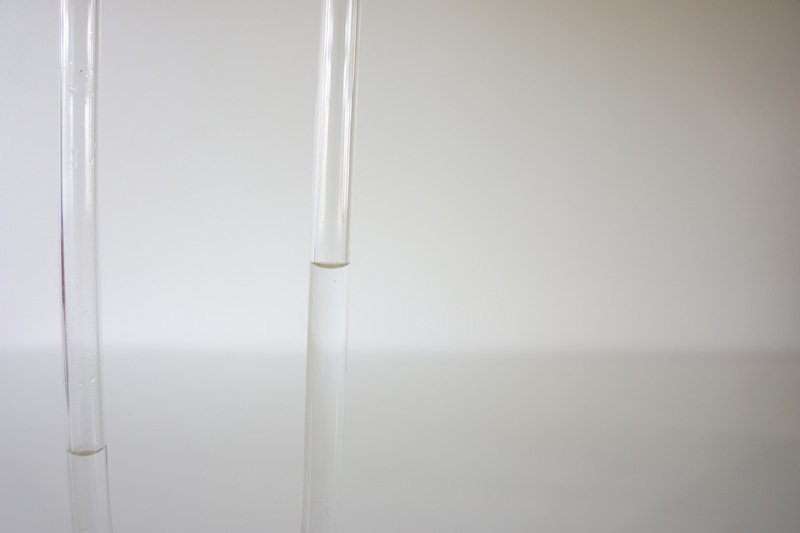 The liquid inside the tube reacts to the slightest temperature change. Expanding and extracting with heat and cold. 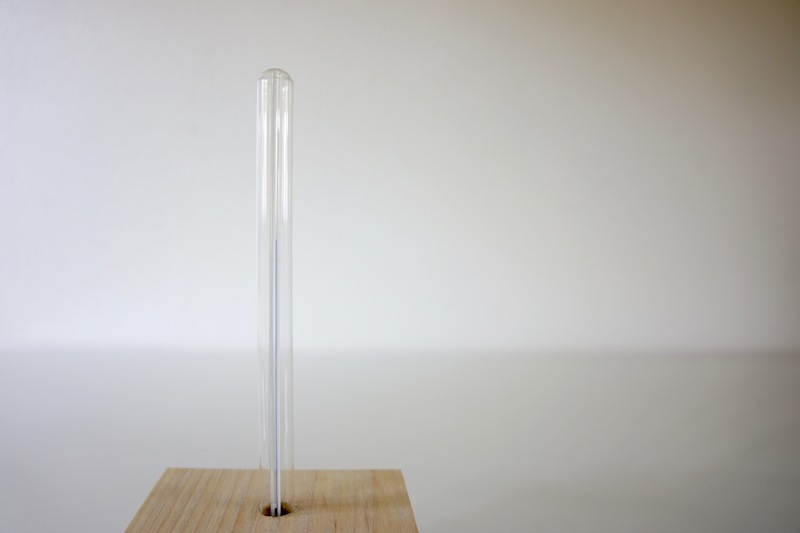 Material: Ash, glass tube, ethanol. I read the book Veðurfræði Eyfellings, published in 1979, where Þórður Tómasson wrote about how the people who lived on the south coast predicted and spoke about the weather. They predicted the weather by observation of the behaviour of animals, the colours of the sky and the ocean. I was really fascinated by how the weather was predicted before technology. It was all about finding patterns. After speaking to my grandmother about this book and listening to her tell me how my great-grandfather would predict the weather on their farm I realised that this knowledge is being lost. Our atmosphere is this invisible network of signals. Our television produces images out of thin air and radios produce sounds by catching radio waves with its antenna. It’s all invisible intangible information that could get lost at any minute and with our daily lives becoming ever more digitalised, we increasingly put our faith in it. 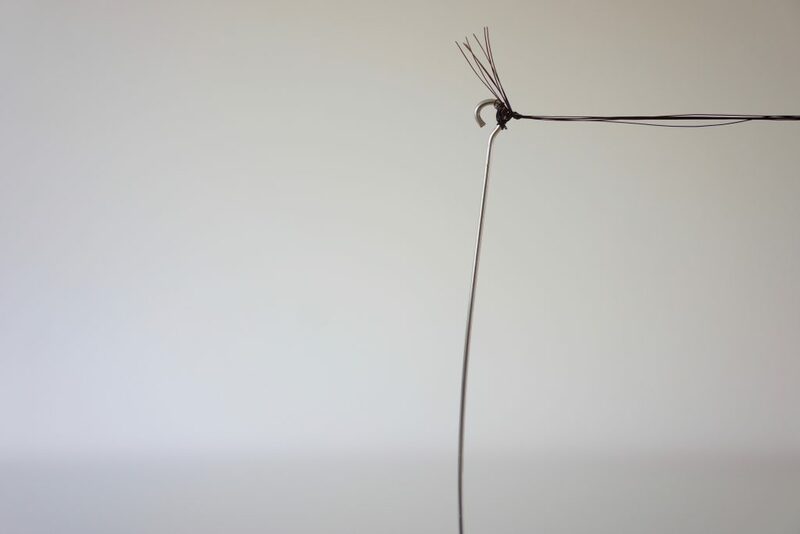 Simultaneously we forget our ability to connect to the physical world, to read into natural patterns of our immediate surroundings and to put fragments of information into a context. Hygrometer, I become atmospheric moisture. An instrument for measuring moisture content in the atmosphere. The device is bound together with horse hair that lengthens and shortens depending on moisture levels at any given place. Shorter hair tension indicates low humidity levels while longer hair tension indicates higher levels. Weather is forecasted by observation of micromanaged sensors, measuring quantified variables of Earth’s atmosphere. Interactions of these variables, how they change over time and the patterns they follow are the basis for determining the weather of tomorrow. With Blikur the numbers and the graphs have been removed, encouraging the viewer to look a little closer, find patterns in one’s surroundings and reestablish the connection to nature again. What are your current plans? Next steps for the project? As a newly graduated designer I’m in a way walking into the unknown and do not really know what hides behind closed doors. But that’s really exciting. I’ll be travelling to Western Australia for a month in the autumn and when I come back I plan to find a studio space and start developing the project further. To see more of Dagný’s work, you can visit her Instagram at @dagnybjorgs or her online portfolio at www.dagnybjorg.com.